Columbus (WCMH) - A blast of cold air is moving towards our area, it it will bring some of the coldest air in years, if not the coldest temps on record over the next few days. In fact, overnight tonight, our temps will drop nearly 25 degrees by daybreak into the upper teens which could provide parts of our area with a slippery start to the day from overnight rain showers. We do have Winter Weather Advisories in effect to cover this potential for Tuesday morning. Tuesday the official high will occur near midnight and temps will drop all day as the winds pick up. So dress Tuesday and prepare for below zero wind chills by the afternoon and early evening as temps will slowly fall, and winds will stay up. The coldest readings will be in the northwest, and the warmest wind chills (I hate calling it warm) will be in the southeast, just above zero all day. 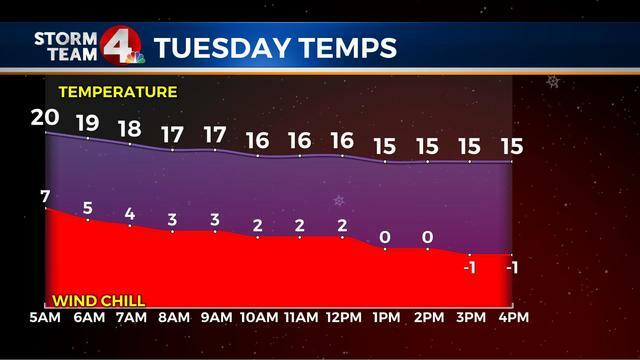 Tuesday night temps will fall back below zero in most of the area, and the winds will stay up. I think due to the fact that we will have winds, fairly cloudy skies, and not much of a snowpack, we shouldn't have the coldest readings. 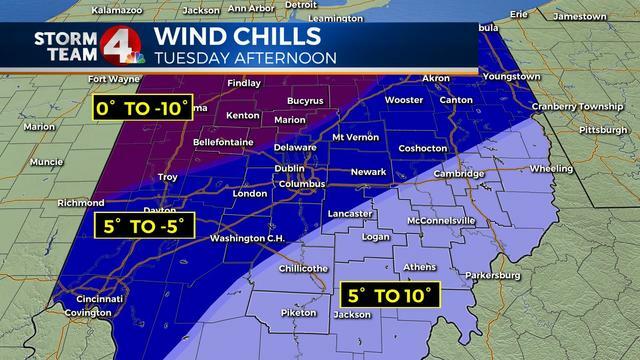 But when you factor in that ugly wind to sub-zero temps, it will feel below zero everywhere on Wednesday morning. Actually these wind chill temps are more of the sustained wind average, but as the winds gust up at times, it could briefly feel even colder. 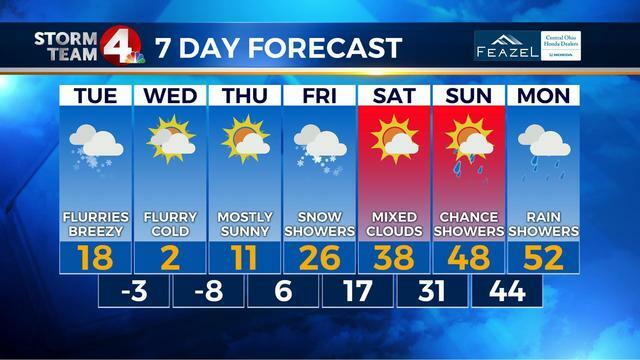 During the day on Wednesday our high temp will be just slightly above zero at +2, but because at midnight we could still be at +8 or so, we will not break the record for the coldest high temp for the date. 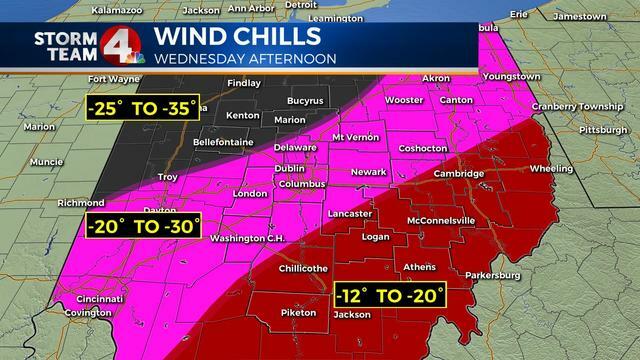 The other bigger problem though, is the winds will be high on Wednesday afternoon, and with barely a rise in temps, we should see our coldest wind chills on Wednesday afternoon/early evening. Overnight Wednesday our coldest temps will occur as the core of this arctic air will be north of us, but still close enough to drop temps to the upper negative single digits in the city, to the middle to upper negative teens outside the city to the east/west/north. 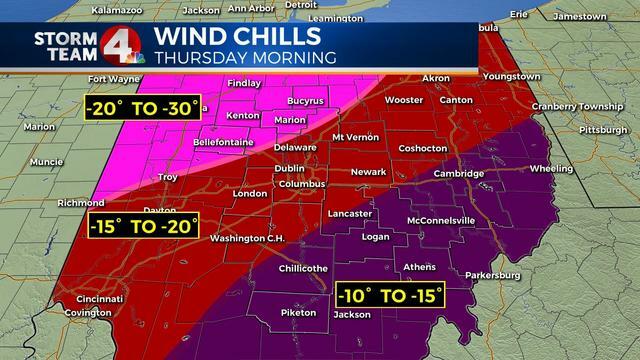 With clearing skies, and less wind, wind chills will not be as horrible, but still dangerously bad for Thursday morning. On a very small plus note, high pressure will quickly move through, which should relax winds and give us plenty of sunshine Thursday. Combined with a 3-5 mph wind, and temps in the lower teens, wind chills should finally climb above zero Thursday afternoon. Looking long term... it is going to get a LOT LOT LOT better this weekend and into early next week. As we get on the backside of this high we will see some snow shower activity intitially on Friday, but then a southerly flow by the weekend. This will push temps into the upper 30s Saturday, closer to 50 with rain showers on Sunday, and into the lower to middle 50s on Monday. There is another system that will come through for late Monday early Tuesday next week, and this could keep temps very warm ahead, and even behind it, on the mild side as this will not be an acrtic system. The Thursday morning low should be shattered, but the rest of the records appear safe, again because Wednesday at 12:01am we should still be in the upper single digits. Remember to bundle up in layers, hats, gloves, scarves, ANYTHING to protect exposed skin. It can take just a few minutes mid-week for frostbite to occur on exposed skin.